Katie Neiman and Phoebe Ottomar have both suffered from Trichotillomania for many years. Here they talk to New! magazine about how it started and the effect it’s had on their lives. 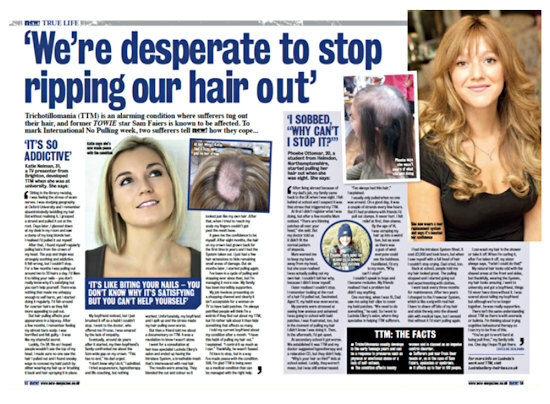 Trichotillomania (TTM) is an alarming condition where sufferers tug out their hair, and former TOWIE star Sam Faiers is known to be affected. To mark International No Pulling Week, two sufferers tell New! how they cope. 'Sitting in the library revising I was feeling the strain of exam nerves. I was studying geography at Oxford University and I remember absent-mindedly twiddling my hair. But without realising it, I grasped a strand and pulled it out at the root. Days later, I glanced down at my desk in my room and saw a clump of my long blond hair, I realised that I'd pulled it out myself. After that I found myself regularly pulling hairs from the crown of my head. The pop and tingle was strangely soothing and addictive. It felt wrong but I couldn't stop. For a few months I was pulling out around 10 to 20 hairs a day. I'd liken it to biting your nails - you don't really know why it's satisfying but you can't help yourself. There was nothign that made me unhappy enough to self-harm, yet I started doing it regularly. I'd fish around for coarser hairs as they felt more appealing to pull out. But hair pulling affects your appearance in a big way. After a few months, I remember feeling my almost bare scalp. I was horrified and felt guilty - it was like my shameful secret. Luckily I'm 5ft 11in so I hoped people wouldn't see the top of my head. I made sure no-one saw the hair I pulled out and I found sneaky ways to conceal my bald patch by wearing my hair up or brushing it back and hair spraying it in place. My boyfriend noticed, but I just brushed it off as a habit I couldn't stop. I went to the doctor, who offered me Prozac. I was amazed by the lack of empathy. Eventuall, around six years after it started, my then boyfriend's family confronted me about the 5cm wide gap on my crown. "This has to end" his dad urged. "I don't know why I do it." I admitted. I tried acupuncture, hypnotherapy and life coaching, but nothing worked. Unfortunately my boyfriend and I spit up and the stress made my hair pulling even worse. But then a friend told me about a documentary on TTM. It was a revelation to know I wasn't alone. I went for a consulation at hair loss specialist Lucinda Ellery's salon and ended up having the Intralace System, a breathable mesh that's interweaved with real hair. The results were amazing. They blended the cut and colour so it looked just like my own hair. After that when I tried to reach my scalp my fingers could't get past the mesh barrier. It gave me the confidence to be myself. After eight months the hair on my crown had grown back for the first time in years and I had the System taken out. I just had a few hair extensions to hide remaining small areas of damage. But six months later I started pulling again. I've been in a cycle of pulling and stopping ever since then, but I'm managing it more now. My family have been incredible supportive. My job involves presenting on a shopping channel and clearly it isn't acceptable for a woman on TV to have bald patches. I'm always petrified people will think I'm a weirdo if they find out about my TTM, but I'd rather talk about it than hide something that affects so many. I told my current boyfriend about my condition after a month. "I have this habit of pulling my hair out," I explained. "I control it as much as I can." Thankfully he wasn't fussed. 'After living abroad because of my dad's job, my family came back to the UK when I was eight. I fell behind at school and I suspect it was the stress that triggered my TTM. At first I didn't register what I was doing, but after a few months my mum noticed. "There are thinning patches all over your head," she said. But my doctor told us it didn't fit with the normal pattern of alopecia. Mum warned me to keep my hands away from my head, but she soon realised I was actually pulling out my own hair. I couldn't tell her why because I didn't know myself. I later realised I couldn't stop. I remember looking at the root of a hair I'd pulled out, fascinated. Aged 11, my habit was even worse. My parents were stressed at seeing how anxious and ashamed I was going to school with bald patches. I as frustrated too, but in the moment of pulling my hair I didn't know I was doing it. Then in the aftermath I'd get upset. At secondary school it got worse. We established that it was TTM and my doctor suggested hypnotherapy and a relaxation CD, but they didn't help. "Why's your hair so thin?" kids at school asked. Luckily they weren't mean, but I was still embarrassed. "I've always had thin hair," I explained. I usually pulled when no one was around. On a good day it was a couple of strands every few hours. But if I had problems with friends I'd pull out clumps. It never hurt. I felt relief at first, then shame. By the age of 14 I was scraping my hair up into a weird bun, but as soon as there was a gust of wind everyone could see the baldness. Humiliated, I'd cry to my num, "why can't I stop?" I couldn't speak to boys and I became reclusive. My friends realised I had a problem but didn't say anything. One morning when I was 15, Dad saw me using hair clips to cover my bald patches. "We need to do something," he said. So I went to Lucinda Ellerty's salon, where they specialise in helping TTM sufferers. I had the Intralace System fitted. It cost £2,000 and took hours, but when I saw myself with a full head of hair I couldn't stop crying. Dad cried too. Back at school, people told me my hair looked great. The pulling stopped and I started going out and experimenting with clothes. I went back every three months for maintenance. After two years I changed to the Freewear System which is like a wig with real hair. I have to shave off bits of my hair and stick the wig onto the shaved skin with medical tape, but I sensed that without it I'd start pullling again. I can wash my hair in the shower or take it off. When I'm curling it, after I've taken it off, my sister always says, "I wish I could do that!" My natural hair looks odd with the shaved areas at the front and sides, but thankfully, wearing the System, my hair looks amazing. I went to university and got a boyfriend, things I'd never have done without it. I was scared about telling my boyfriend but although we're no longer together, he was really supportive. There isn't the same understanding about TTM as there is with anorexia or bulimia. I'm thinking about trying cognitive behavioual therapy so I can try to be free of this.